Mysteries and moustaches of India | Where to next? I’ve just finished reading a fun detective story I bought in India—The case of the deadly butter chicken by Tarquin Hall. 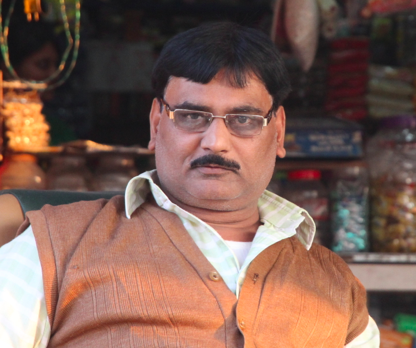 Vish Puri is the detective and central character. The book is very entertaining with wonderful descriptions of the sights, food, personalities and thinking we’ve encountered in India. Two of the crimes (there were plenty of murders too) in this book involved a couple of national champion moustache growers, who had their facial hair stolen in the middle of the night. The book makes it clear that moustaches are important in India. Apparently, certain professions, such as hotel doormen, require a magnificent moustache. We saw some classic moustaches during our travels. I managed to photograph a couple, but not any of the most impressive. So enjoy these few. 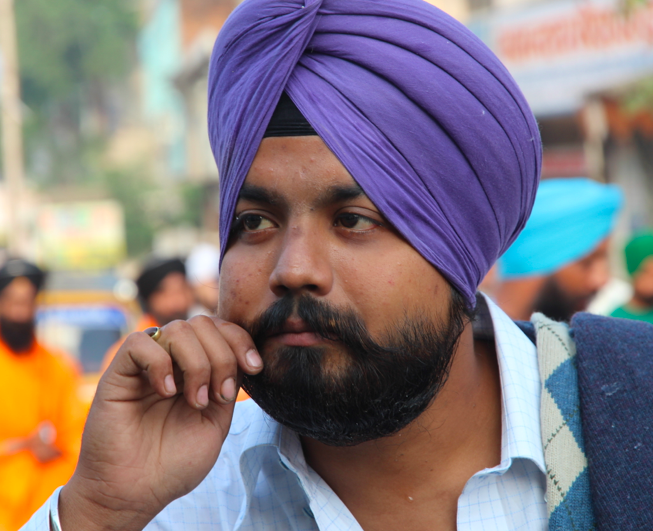 Sy of New York City, a faithful follower of this blog, has reminded me that my spiel on traffic in India has a good photo of Sikhs with moustaches and long beards. P.S. In case you’re interested, Tarquin Hall has written more Vish Puri mystery stories. They get a big supportive tick from Alexander McCall Smith (of No. 1 Ladies’ Detective Agency fame) and from me too. Ooooh I’m loving these, esp. the last dapper chap! 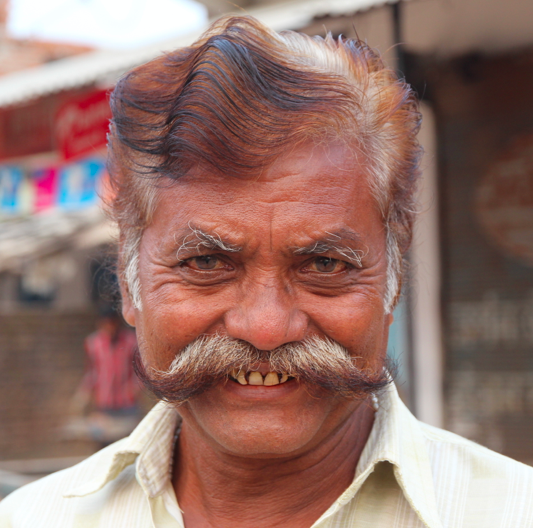 Excellent example of a local Indian (last chap photo) with a very interesting moustache. I like the coloring of his moustache and hair on his head… as he shows his age. And green eyes… nice photo. I was so pleased that he was happy to have me take his photo. He has a truly interesting face. I’m with everyone else Peggy; the last chap in this series definitely has the best moustache. Thank you. He really does have a wonderful face and an amazing moustache.